If your kid is born pretty much by the book, and you're in a hospital in the US, chances are he's going to spend most of his time in one of these: a sweet, sweet molded plexiglass bassinet that rides atop a gorgeous stainless steel cart of some kind. If you have a thing for industrial design, and your kitchen is already restaurant-grade stainless steel tables and counters, and you've struggled mightily to keep the cutey cute, tole-painted nursery furniture out of your house, chances are you will be wanting one of these bad boys for yourself, er, I mean, for the kid. If the first time you set eyes on them, though, is when your own kid rides one into the recovery room, chances are it's too late for you to be dropping $900 and up on a bassinet that probably has a several weeks lead time anyway, even if that plexiglass tub would look great filled with ice and champagne and what not as soon as the kid outgrows it. And if you've just decided to start a blog about such foolish pipe dream-inspiring gear, chances are you'll come home with the mfr and model info scribbled on a scrap of paper. Then you'll lose it because, hello, you've got a newborn kid to take care of. Then almost two years later, you'll ask a friend who just started his rotation in the pediatrics unit to write it down for you. And so here we are. At Georgetown anyway, the cart itself is a Coleman Bassinet by Blickman Health Industries. It is available with shelves, an open cabinet, or a drawer, and it ranges up to $1,200. With two cabinets, it's $1,283. Naturally, the basket is sold separately. From what I can gather, the bassinet basket is $125. At G'town, it's called the Caliber Infanette Basket, and it's manufactured by Allegiance. But I can find precious little information about this version online. Many people will feel this is an exorbitant amount of money to spend on a bassinet for use in a home. Many people will be right. Many people will not buy this for their child. Many people will be applauded for their common sense. But a very few people, probably loft-dwellers, will find this suits their needs perfectly. And if a few of them don't want to shell out $1,500 for the bassinet, they will wisely check for used medical supply dealers, who will sell them this indestructible gear, broken in, at a fair discount. A very few, probably design snobs beyond even my understanding, will search for weeks for just the right industrial/hospital-grade bassinet. Why will they do this, you ask? Because they will have seen the picture below, and they will have the beautiful steel curves of this incredible piece of Marcel Breuer-inspired sculpture--which also happens to be an heirloom bassinet for some lucky child--burned into their brains, and the standard Blickman curves will suddenly seem incomplete. Also, they'll see that these bad boys sold in lots of two for $40 apiece at a government liquidation auction in Columbus last fall, and damned if they're gonna miss the next one. I did **NOT** need to know about that auction site. 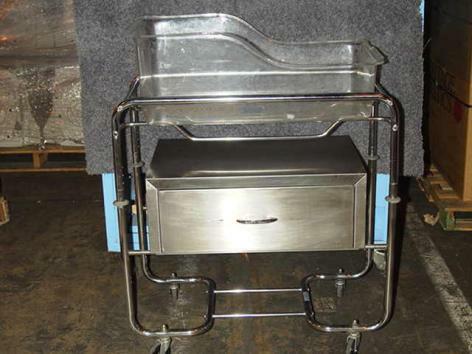 And how cool is it that they have a bassinet listed with a treatment station and a linen's cart all in stainless? I can now see doing an entire nursery in a post-modern medical industrial theme. It would go so well with my theories about parenthood as a form of sociological experimentation. So, now you know exactly how my husband and I came to spending an entire day at a San Diego County auction just so we could buy two totally sweet old McDowell-Craig desks for $4. Our local university surplus had a cadaver table for sale just before Halloween, and I tried to convince my wife we needed on, but no luck. Hey, I found a place where you can buy these Blickman stainless steel carts brand new for way LESS! They start under $700 and are the exact same bassinets as described above. You still have to buy the plastic basket seperately, but even that is cheaper than anything I 've been able to find anywhere else. I tried to buy from the used medical company that is suggested in the article above, but they were out of stock when I called. Hope this helps! We seriously considered going this route. Most of the other bassinets on the market are frilly, cloth-covered cheap hunks of plastic that parents constantly complain about. After having this one in the hospital, it seemed like a great alternative -- until we saw the price! Instead, we got an Arm's Reach Mini Co-Sleeper, which we use as a bassinet. It has relatively clean lines without being too industrial or sterile, and no frills or cheap plastic. We got it in a nice neutral toffee, which fits harmoniously into most rooms in our house. Ya, what pleasant memories but I too saw the price and nearly went to ER!! or case room, for a Premature delivery!! YIKES. How to make these cheaper? it's not like they're one of the things goin' missing in hospital take homes, etc. I remember getting home from the hospital and missing this bassinet... but not for the aesthetic, for it's ability to see the baby right through the plastic! It's so convienant. I remember waking up every twenty minutes the first 8 weeks because I had to sit all the way up to be able to see into the bassinet to make sure he was still breathing! But with this one, you just open your eyes and can see the baby. I'd buy one if they weren't so ugly! My niece has back problems and she is expecting her 2nd child and this would be great for her to have the baby mobile without carrying him around while she is at home. But I need to find one cheaper...any other places to go for cheap $$$???? I've got one of the plastic baskets that sit on top of the stainless bassinet. I believe it is taken from a Wilson brand bassinet and not a Blickman, but looks identical. If anyone is interested let me know and I can send pictures. I'll sell cheap! Are you still willing to sell your bassinette? Where are you located? I'm in Sydney Australia. Yes i'm still willing to sell it. I'm located in Illinois, USA. Email me at evilar@lycos.com. Do you still have a plastic bassinet for sale?